Visit www.maxapooch.com for a great Labrador Retriever who loves to pick up litter in the park. This is a great job for a restless working dog breed (sporting dog who works) and Max really seems to love it. Not only is Max picking up plastic bottles from the park for recycling, he is also promoting the importance of adopting dogs rather than buying dogs from puppy mills. American Dog Blog is dedicated to providing information about dogs as well as entertaining with cute dog videos, stories, puzzles, and more. Only someone who loves dogs could put together such a blog. But I don’t just love dogs. I love all animals, including the wolf which is the ancestor of our domesticated happy-go-lucky friends. Since wolves and dogs are so closely related, I wanted to share a new website that I put together just for the wolf. 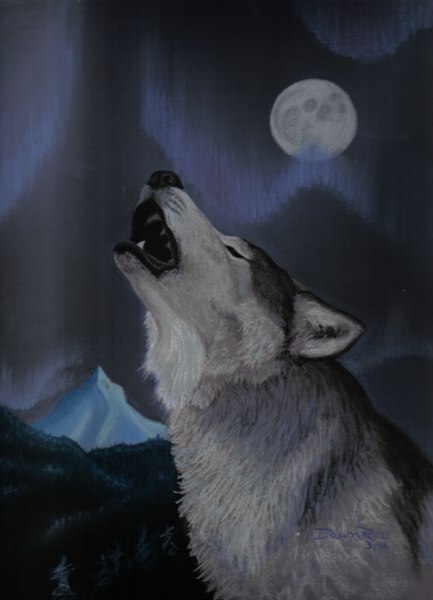 Information About Wolves not only has great information about wolves’ habitat, behavior, and hunting tactics, it also has some great images of wolves and artwork of wolves. And it has a fictional wolf tale. I hope you enjoy Information About Wolves as much as I enjoyed creating it. Feel free to share you feedback. 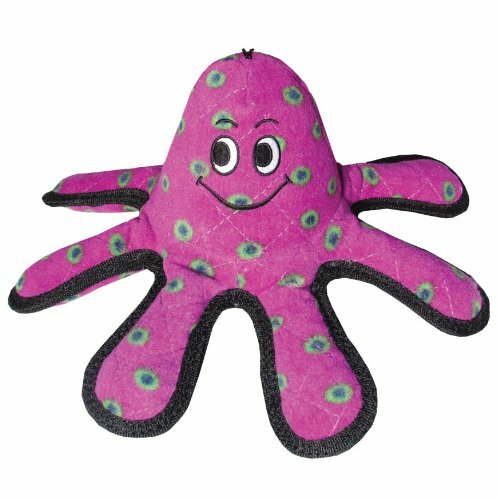 Tuffys dog toys are not indestructible but they are much more durable than regular plush dog toys. Sephi and Maya love their plush squeaky dog toys. The problem is that they chew them up and pull out all the stuffing within a matter of minutes. 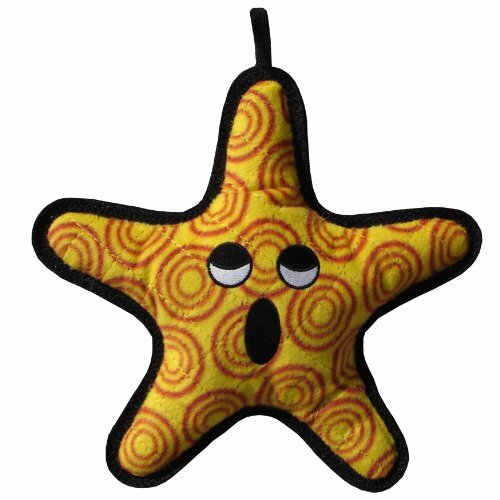 A plush dog toy is lucky if it lasts more than ten minutes. If your dogs are like mine, then you probably hate buying dog toys that won’t last long. The solution: get dog toys which are more difficult to tear up. Sephi and Maya have Kong dog toys, Buster Food Cubes, and Fire Hose dog toys. But none of these dog toys are plush. Sephi and Maya like these toys, but they LOVE plush. One particular brand of dog toys that I like are made by Tuffys. 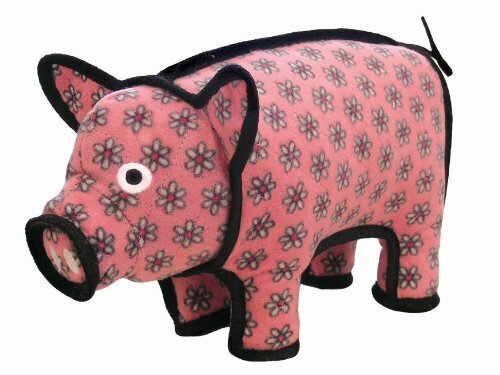 Tuffys dog toys are plush dog toys but they are made with four layers and sewn with a total of seven seams, making this plush toy far more durable. I have to admit that Maya was still able to destroy one of these Tuffys dog toys, but it took her several days instead of several minutes. To minimize her ability to chew her dog toys into pieces, I supervise her when she plays. If her chewing gets too intense, then I take her dog toys away and give her something else. Now her Tuffys dog toys last several weeks. Sephi and Maya’s love for plush dog toys is satisfied and so is my wallet. As you can see, Tuffys dog toys come in lots of different colors and shapes. The public pool was open to dogs at Young’s Park & Pool in Overland Park on Saturday, August 20th. Maya had a lot of fun! 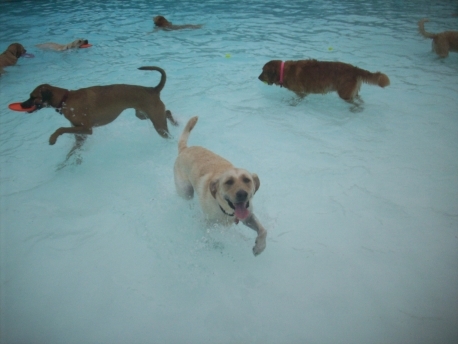 There is another dog pool day at the Tomahawk Ridge Aquatic Center in Overland Park on September 10th. Maya will go to that one too!!! There are so many ways to dance, even for dogs. Some dogs “break dance” by sliding and twisting on the floor. Some dogs get on their hind legs and prance. And some dogs just wiggle! Sephi and Maya don’t dance. Sephi can’t balance well on her hind legs. However, she does this cute prance thing backwards down the hall at feeding time. I will have to get a video of that someday. Maya does a few tricks on her hind legs, but she is a long way from dancing. Does your dog dance? If so, how does he do it? Share a story about your dog. We’d love to hear it! The Chinese Shar-Pei dog breed is one of the oldest dog breeds, originating in China at least 2,000 years ago. Confirmed records exist from the 13th century in the southern province of Guangdong. The Chinese Shar-Pei was used for hunting, guarding, and herding. It was also used as a fighting dog – both in fighting pits and in war. Despite his fighting history, the Chinese Shar-Pei today is a companion dog. Sadly, the Chinese Shar-Pei nearly became extinct when China became a communist country. The dogs barely existed in the countryside. However, a few were bred in British Hong Kong and Taiwan. The Hong Kong & Kowloon Kennel Association helped to introduce the Chinese Shar-Pei in the United States. He was originally introduced as a fighting dog. But the Chinese Shar-Pei did not gain in popularity in the United States until the 1970s when his near extinction status was publicized. It was not until 1988 before the Chinese Shar-Pei was accepted into the American Kennel Club (AKC) in the Miscellaneous Class. And he wasn’t accepted into the Non-Sporting group until 1991 (officially in January 1992). The Chinese Shar-Pei may be descended from Mastiffs and spitz-type dogs. And he is a close relative of the Chinese Chow Chow, also a spitz-type dog. The resemblance of the Chinese Shar-Pei to the Mastiff is the thick heavy skin and short bristly hair. His resemblance to a spitz is his curled tail. His independent nature is also reminiscent of a spitz, as is his loyalty to his family. Like the Chow Chow, the Chinese Shar-Pei has a blue-black tongue, fleshy muzzle, thick build, and curled tail. Both dog breeds are reserved and wary of strangers. They can be stubborn and sometimes aggressive with other dogs. Careful positive reinforced training is needed. The Chinese Shar-Pei is not highly affectionate or playful, but he is extremely devoted to his family. He is generally a calm and quiet companion, suitable as an indoor dog. But he does need daily walks. The Chinese Shar-Pei stands about 18 to 20 inches tall and weighs about 45 to 60 pounds. He should be a solid color such as red, fawn, blue, black, or white. His coat, which is very harsh and short, needs little brushing. More attention will need to be paid to his skin between the wrinkles to make sure there are no irritations or infections. The face of the Chinese Shar-Pei is fleshy and he has wrinkled skin on his large head and back shoulders and neck. He has small sunken eyes and small triangular ears. His tail is thick and short and curls up over his back. As with most purebred dogs, the Chinese Shar-Pei is prone to a number of genetic health issues. The most common is allergies and skin issues. Due to the thick folds of skin around his eyes, he is also prone to have eyelid problems. The Chinese Shar-Pei also tends to have ear problems and as a large dog breed, he is also prone to hip dysplasia. Patellar luxation can also be an issue. In patellar luxation, the knee cap can slip out of joint, causing terrible pain and lameness. To reduce the chances of getting a Chinese Shar-Pei with health problems, research the breeder thoroughly. Being an AKC registered dog does not, by itself, promise a healthy dog. Most reputable breeders will be members of the Chinese Shar-Pei Club of America. A reputable breeder may have also had the parents of the pups tested for dysplasia and other health problems. A properly bred Chinese Shar-Pei can be great with children, whereas an improperly bred Chinese Shar-Pei can have aggression problems. If you are considering a Chinese Shar-Pei, you will be rewarded with a loyal family pet. Grooming maintenance is minimal and exercise requirements are average. Be sure to use positive reinforcement in training in order to help overcome his willful nature. And socialize early to avoid aggression issues with other dogs. 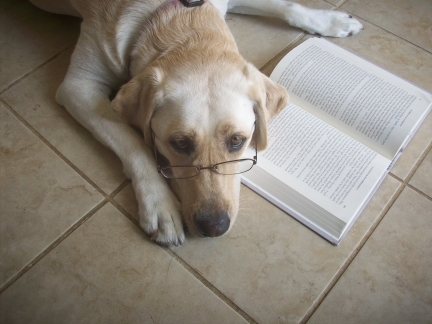 For more information about the Chinese Shar-Pei, visit our Dog Lover’s Book Store with Amazon.com. 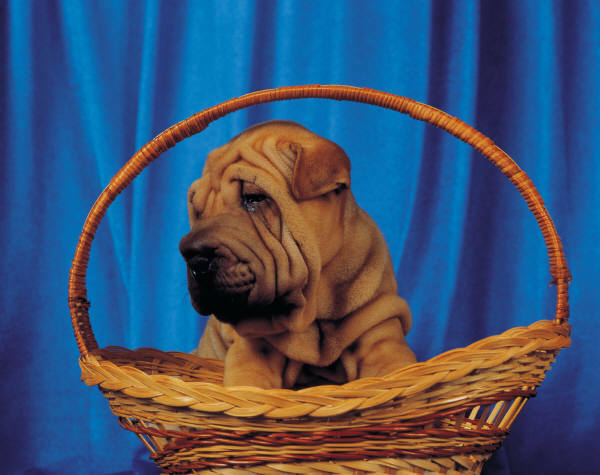 The dog breeds tab has lots of great books about the Chinese Shar-Pei, including the Barron’s “Shar-Pei, a Complete Pet Owner’s Manual”. Does your dog talk or sing? It may be something your dog just likes to do. Or perhaps some sound annoys him or triggers it, such as the piano or the theme song to Law & Order. Or perhaps it could be something you taught him, whether purposely or inadvertently. I inadvertently taught Sephi how to ‘talk’. She made cute sounds when he was a pup and I thought it was so cute that I encouraged it. Be careful if you encourage your dog to make noises. Your dog may be inclined to do it more often in order to get your attention. Sephi, for example, now makes noises to remind me that it is dinner time. Sometimes it is annoying because it is too early in the day for dinner. Or sometimes she gets carried away and barks, which is not so cute. Tell us if your dog talks or sings. Does he do it often or only on command? Cone Collar for Dogs – Does Your Dog Hate it as much as my Dog? This is a dog I had some years back. His name was Achilles and he was a Chow / Shepherd mix. I felt like I was torturing my dog when he wore his cone collar. But he had to wear it. Otherwise, he risked infecting his surgical stitches by licking them. When I first put the cone collar for dogs on him, he tried to bite at it with no success. It would have been comical if he wasn’t so obviously annoyed by it. In order to distract him from his annoyance, I played with him while he wore the cone collar – not too stressful of a play, however, because of his surgery. I also had him do basic tricks for treats so that he was more interested in paying attention to me and getting his treats than he was in the cone collar. And I also took him for a walk – the thing he loved most in the world. I was also careful not to laugh at him unless it was a fun-play laugh. Dogs can be sensitive to teasing. Achilles was not as sensitive as some dogs I have had, but he still didn’t like being laughed at. I could see his shame when he wore the cone collar so I did my best to show him that the cone collar for dogs was not a bad thing. Although Achilles was annoyed by the cone collar at first, care, compassion, and fun distraction helped him get used to it. 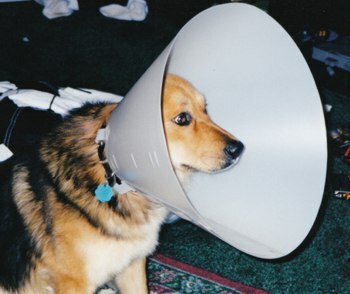 The cone collar for dogs does not have to be a bad experience. For times when his health and safety are a concern, help your dog wear it without additional stress. Come visit the Ad Astra Park & Pool in Lenexa, Kansas on Saturday, August 13th for some great doggy fun! The Tails on the Trails event will host pet vendors, dog adoptions, pet contests, dock diving dog demonstrations, microchipping, vaccinations, a pet parade, and best of all…. dogs will be allowed to swim in the pool!!! 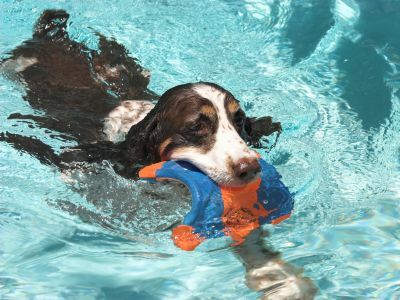 The swim event for the dogs is $5 per session if paid in advance or $8 on the day of the event. This money goes to help the Lenexa Parks and Recreation. How does helping the Lenexa Parks and Recreation help dogs? Well, Lenexa has a fantastic dog. The Shawnee Mission dog park is the best dog park I have ever seen in this area. Upkeep of this great park costs money. And you can tell when you visit the Shawnee Mission dog park that Lenexa Parks and Recreation does a great job of maintaining it. You can also donate to the non-profit organizations which will be there. There will be shelter dogs, dog rescue groups, and other great organizations that help dogs. If you are looking to adopt a dog, this would be a great place to start. We will be there again this year with our booth for http://www.petautosafety.com and http://www.animalfigurinestore.com. Visit us and the other pet vendors for some great pet products and some tail-waggin’ fun! For more information on this event, visit http://www.ci.lenexa.ks.us/parks/festivals_tails.html.